I have a new job. And with the new job comes a new location – I am now riding in pretty much diametrically the opposite direction, heading west to Chatswood, instead of into the city. Although not especially different in terms of distance (just a few kms more), it couldn’t be more different in terms of route. Previously I could ride into work in the CBD pretty much on separated bike paths / SUPs the whole way. 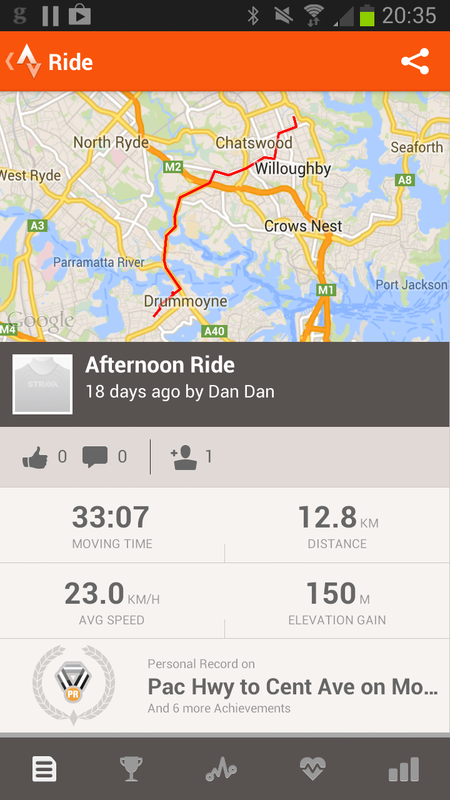 Now I have to negotiate the cycling glory that is Gladesville Bridge before braving the wonders of Mowbray Road. It’s interesting in a number of ways, and has certainly given me pause for thought about many aspect of cycling in Sydney. I am the only person in my new office who rides to work. In the city, I was one of many. My office in the CBD was right on the Kent St cycleway. Built it and they will come. Some facts. My new route takes me from Five Dock over Gladesville Bridge, then on to Centennial Avenue and then right onto Mowbray Road. 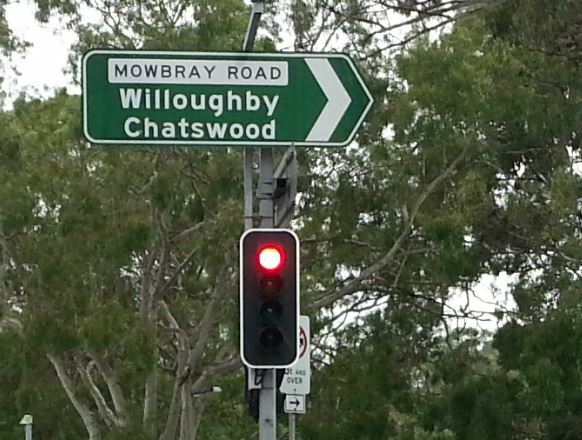 I follow that over the Pac Hwy, and then a few kms further on turn left down some local streets to get to Chatswood. It’s about 13km, and is mostly uphill on the way there – which makes for a good workout in the morning, and a cruisy ride home. That means it’s quicker coming home – 33 minutes as opposed to 38. I fired up Strava again, and this is what it had to say (this was from the ride home). It certainly made me realise how spoiled I was before. ‘Spoiled’ and ‘Victoria Rd SUP’ and not words that often go together, but for all its faults there is something to be said for getting out of the traffic. Anyone could have ridden my old commute, but that certainly isn’t the case with the new one. I now have to mix it up with cars. Lots and lots of cars. For motorists the route is very stop-start, with queues at the various traffic lights frequently so long that it takes two or three phases for the cars at the back to get across. My tactics for this vary; on Mowbray Road I filter through the cars, either on the left or down the middle of the two lanes. Heck, I’m not sitting there just because all those idiots chose to take two tonnes of metal to work. Burns Bay Road is a little more tricky, as it’s uphill. This means I end up getting stuck in the jam, and then in turn holding up the cars as the traffic moves and I’m grinding up the hill. I’ve actually taken to riding up the hill on the footpath – just because it’s faster for me, as I don’t have to keep stopping. It’s far from ideal (and slower than riding on the road would be if the road was not busy), but as it is my average speed is pretty much exactly the same as the traffic. On the faster sections (which is a lot of the ride home) I’m mixing it up with the cars – for much of the time going faster than they are, zipping past on the inside and then filtering at the lights. It’s kind of exhilarating, and not something you do much of in a CoS cycleway. But this is riding for the 1% of lunatics, not normal people. It speaks volumes about cycling culture in Sydney, the safety record for bicycles and just how high the barriers are to making cycling an everyday activity. I also see a little more aggression from motorists, with some close passing and crazy swerving in front of me at traffic queues. It’s not bad, but again it’s something you are insulated from on even a very poor SUP.